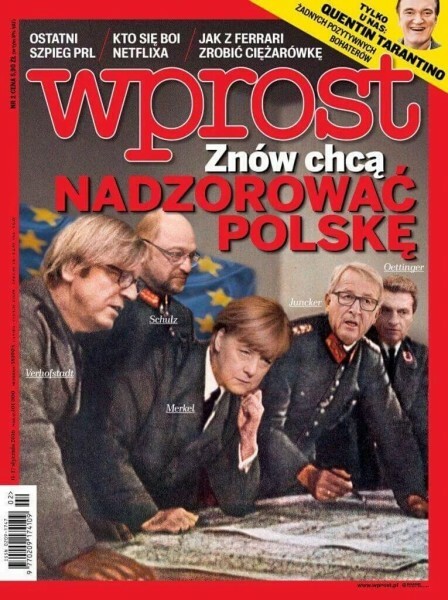 … only for Brussels to retaliate and launch an “unprecedented” review of Polish media laws, a move which Poland angrily responded is far beyond the EU’s domain. Well, as so often happens, whenever there is a political spat in Europe, the rating agencies are quickly involved (thing S&P and Moody’s downgrades and upgrades of Greece depending on how well the vassal nation is “behaving”), and moments ago S&P downgraded Poland from A- to BBB+ outlook negative, precisely due to Poland’s new media law which has been the topic of so much consternation over the past week. In other words, S&P is now nothing more than a lackey for Brussels, threatening to send Polish yields higher if Poland does not fall in line. Since winning the election in October 2015, Poland’s new government has initiated various legislative measures that we consider weaken the independence and effectiveness of key institutions, as reflected in our institutional assessment. We have therefore lowered our long-term foreign currency sovereign credit rating on Poland to ‘BBB+’ from ‘A-‘ and our long- and short-term term local currency sovereign credit ratings to ‘A-/A-2’ from ‘A/A-1’. The negative outlook reflects our view that there is at least a one-in-three likelihood that we could lower the ratings within the next 24 months if monetary policy credibility is undermined or if public finances deteriorate beyond our current expectations. On Jan. 15, 2016, Standard & Poor’s Ratings Services lowered its long-term foreign currency sovereign credit rating on the Republic of Poland to ‘BBB+’ from ‘A-‘ and its long- and short-term local currency sovereign credit ratingsto ‘A-/A-2’ from ‘A/A-1’. The short-term foreign currency sovereign credit rating was affirmed at ‘A-2’. The outlook is negative. We also revised our transfer and convertibility (T&C) assessment on Poland to ‘A’ from ‘AA-‘ (a T&C assessment reflects our view of the likelihood of the sovereign restricting nonsovereign access to foreign currency needed for debt service). The downgrade reflects our view that Poland’s system of institutional checks and balances has been eroded significantly as the independence and effectiveness of key institutions, such as the constitutional court and publicbroadcasting, is being weakened by various legislative measures initiated since the October 2015 election. Poland’s new ruling party Law and Justice (PiS), which holds an absolute majority in the parliament (Sejm) and the senate, has set out to make fundamental changes to Poland’s institutions. For example, the constitutional court’s ability to work efficiently and independently will likely be undermined, in our view, by changes to the court’s composition and decision-making process. The government’s new media law, as another example, gives the government extensive powers to appoint and control the directors and supervisory boards of public broadcasters. A third law terminates contracts of all current senior, career civil servants and removes a constraint regarding previous party membership, therefore enabling the new government to change the structure of the civil service. In our view, these measures erode the strength of Poland’s institutions and go beyond what we had anticipated regarding policy changes from the general election. The revision of the T&C assessment to ‘A’, two notches above the foreign currency rating on Poland, reflects our expectation that the Polish government’s overall policy inclination will be more interventionist, which could ultimately also impact the foreign exchange market. The change in the rating outlook to negative reflects our view that there is potential for further erosion of the independence, credibility, and effectiveness of key institutions, especially the National Bank of Poland (NBP). Moreover, we no longer expect Poland’s fiscal metrics will improve as we previously forecast. We also foresee some reversals in Poland’s sound macroeconomic management of the past years, for instance by targeting certain sectors with new taxes. The ratings remain supported by Poland’s relatively moderate external financing needs and strong growth potential. The economy benefits from a floating exchange rate regime and domestic capital markets that permit the government to finance itself in local currency at long-dated maturities. The ratings are constrained by Poland’s still low income levels compared with its Western European peers, especially in light of recent Polish zloty (PLN) depreciation and long-term challenges to public finances, primarily stemming from the pension system. Since winning the Oct. 25, 2015, parliamentary election, Poland’s new government, led by PiS with an absolute majority, has introduced a number of legislative initiatives. A law that changes the decision-making process of theconstitutional court, which in our view would undermine its ability to work effectively and make decisions in a timely fashion, was signed into law by President Andrzej Duda before year-end 2015. Similarly, a law that moves the power to appoint the management and supervisory board of public broadcasters to the Treasury Ministry significantly weakens the independence of these institutions and has the potential to make them political instruments, in our view. While PiS’ absolute majority has removed pre-election concerns about increased political instability resulting from fragile coalition arrangements, we expect significant friction will persist between PiS and the opposition. In addition, we see a risk of internal tensions within PiS between more conservative and moderate forces, especially given the growing public discontent about these new measures. Similarly, taxes on banks, insurers, and large retailers seem to be more focused on sectors that are predominantly foreign owned, thereby raising questions about Poland’s attitude toward growth-driving foreign direct investment. Moreover, pronouncements about, for instance, the refugee crisis, may heighten tensions between Poland and many Western-European EU states. We have upwardly revised our fiscal deficit forecast for 2016 to 3.2% because we consider that various spending-side measures, either planned or announced, are not fully offset by revenue-side measures or expenditure cuts. These measures include a reversal of the previous pension reform so that the retirement age for women will again be lowered to 60 and for men to 65, higher childcare benefits through the Family 500+ program, a higher tax-free allowance and minimum wage, and free medicines for the elderly. Proposals on the revenue side are so far are limited to a 0.44% tax on bank and insurance company assets and a yet-to-be-decided retail turnover tax. In addition, the PiS-led government has decided to amend the expenditure-stabilizing rule, only recently introduced, by substituting actual inflation rates with the 2.5% NBP target, in turn increasing potential expenditure levels. Lastly, the government has decided to amend the 2015 budget to give itself more spending flexibility in 2016, for instance by booking the proceeds of the October LTE (long-term evolution) cell phone network auction (PLN9 billion or 0.5% of 2016 GDP) in 2016 rather than in 2015. Moreover, we do not expect revenue-side measures will be sufficient to compensate for higher spending, and view the macroeconomic assumptions underpinning the 2016 budget as too optimistic. We therefore expect that larger fiscal deficits than we initially forecast will persist in the coming years. Nonetheless, we expect general government debt will remain broadly stable at about 51% of GDP through to 2018. At the same time, lower debt resulting from last year’s pension change and low interest rates continue to contain the government’s interest burden, which decreased to 4.6% of general government revenues in 2015. In an environment of changed risk perception and continued political uncertainty, we expect this trend will reverse and push interest costs back up to 5% of general government revenues by 2018. The share of foreign currency debt in total government debt remains somewhat high at 34%, as does the proportion of debt held by nonresidents at 56%. However, the relatively high share of long-term oriented nonresident investors, for instance foreign central banks and public institutions that own around 23% of domestic securities, reduces the risk of sudden large sales of Polish government bonds, in our view. After a further acceleration over 2015, we expect real GDP growth in Poland will remain strong and average 3.3% over 2016-2018. Stronger domestic demand resulting from income-boosting government policies and a continued recovery in the eurozone, Poland’s main trading partner, bode well for robust economic expansion. Stronger wage growth and subdued inflation will likely continue to boost real incomes further, while a potentially looser monetary policy stance could also help contain household and corporate borrowing costs. Additional long-term challenges to the Polish economy could arise if the economy fails to move from a growth model relying on cheap labor and labor-intensive industries to higher-value-added and more innovative industries. In that sense, a reform of the loss-making, primarily state-owned coal mining sector might become an important factor, although such reform seems less likely under the PiS government. Similarly, the 2014 change to the pension system, such as the dismantling of its defined contribution pillar, raises questions about the long-term sustainability of the Polish pension system, which will likely be pressured by the government’s decision to revert to a lower retirement age. We expect the current account deficit will gradually widen over our forecast horizon. Lower import prices and strong exports have helped narrow the deficit, but we expect the import component of Polish exports will remain high and net exports will stay negative. Nevertheless, we think Poland’s demonstrated ability to draw on EU funds, and a revival in foreign direct investment, should comfortably finance most of these deficits, despite perpetually high net errors and omissions. However, with tensions between Poland and the EU on the rise, access to EU structural funds may become more difficult. Nonetheless, Poland benefits from some important buffers that we expect will help keep external borrowing costs down. These include a flexible exchange rate regime, which helps the NBP pursue an independent monetary policy, and a flexible credit line with the International Monetary Fund, which was reduced in January 2016 to $18 billion and is expected to be phased out over the coming years. to finance its net external liabilities. Our base case is that gross external financing needs will remain fairly constant at approximately 86% of CARs and usable reserves until 2018. While the financial sector is generally profitable and predominantly (63%) deposit funded, and we classify it in group ‘5’ of our Banking Industry Country Risk Assessment (see “Banking Industry Country Risk Assessment: Poland,” published June 30, 2015, on RatingsDirect), we nevertheless believe it may experience a period of heightened stress. We expect three factors will affect banks in Poland in 2016. The introduction of a banking sector tax of 0.44% on assets is going through the parliamentary process, while a decision on a conversion of about 570,000 Swiss-franc-denominated mortgage loans (into zloty) has yet to be made. In addition, the government is requiring Polish banks to step up their contributions to the deposit guarantee fund following the bankruptcy of a small lender, SK Bank. Although the issue of a conversion of Swiss franc mortgage loans had moved out of focus since the elections, the President unveiled a proposal on Jan. 15, 2016. While the exact consequences of this proposal for the financial sector remain uncertain, we expect certain institutions will come under more stress. Lastly, PiS will have significant power to shape the future path of monetary policy because the Polish president, parliament, and senate can nominate a total of nine new monetary policy council members, including the governor of the NBP, in 2016. The negative outlook reflects our view that there is at least a one-in-three possibility that we could lower our ratings on Poland in the next 24 months. We could lower the ratings if we perceived a further weakening in the independence, credibility, and effectiveness of key institutions, most importantly the NBP. In addition, we could lower the ratings if public finances deteriorated beyond our current baseline scenario as the revenue and expenditure balance becomes more negative. On the other hand, a reversal of the government’s efforts to change and control Poland’s key institutions, as well as sustained strong external performance, leading to further reductions in net external debt could lead us to revise the outlook to stable.